This is a fun entry. This is from a somewhat generic brand that creates very budget novelty handbags. If anything, they attempt to reference Juicy Couture, but they are clearly items that you purchase at the five and dime for a child to play dress up with. The design also very loosely apes some Juicy Couture hang tags. The use of Juicy colors pastel pink with black text and silver accents gives it away. 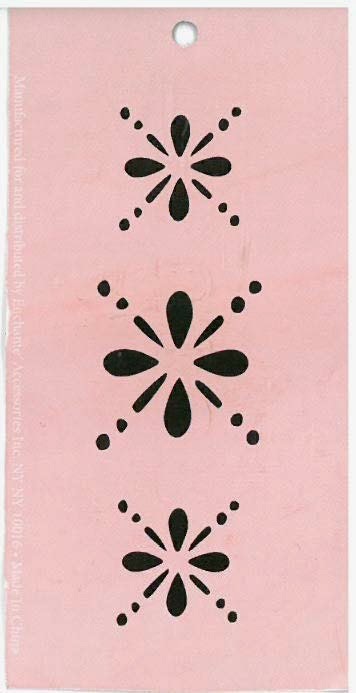 The black flower cut outs are at least a little interesting with additional accents on the reverse. The front is a nightmare, on the other hand. The silver foil text is centered, which is great, except that the pink flower is off-set. None of the elements line up in any sort of interesting or meaningful way. Instead, we see an "O" that could be used to mark the disk of the flower, but instead of slightly off. The "C" could encase the petal, but again, slightly off. The "U" is just sort of there as well. The second flower on the front is a moment of clarity. The alignment is nice and the it makes a cute detail. If only it weren't the only one, we would be in much better shape.